No, it’s not spaghetti and meatballs with a tomato sauce. It’s better! This dish has flavors of Vietnam and Thailand. The noodles are Japanese udon noodles. I love their silky texture. The meatballs were made using sirloin roast and pork loin ground together with garlic and green onions. The meat was seasoned with some soy sauce as well and bound together with an egg and bread crumbs. The meatballs were cooked on a sheet pan in a 375 oven just until cooked through. I had plenty leftover that I used for a pizza. I’ll post more on that tomorrow. To create the sauce, I started with garlic and ginger in a hot wok and stir fried some finely julienned carrots. To the pan I added a teaspoon of Vietnamese sour soup paste. This is a blend of spices that gives a tangy kick to the dish. More soy sauce went in along with some milk that had a little bit of corn starch stirred in for thickening. To give it a bit of Thai nuance, I added a tablespoon of creamy peanut butter. Yes, this is a spicy, tangy peanut sauce. I added enough water to keep it liquid as it cooked. I added the cooked meatballs to the sauce and simmered them for a few minutes. Meanwhile my udon was boiling. Once it was cooked to almost done I threw the noodles into the sauce and cooked them for another minute or two and coated everything with the sauce. I finished it off with some lemon juice at the last minute to give it even more tang. 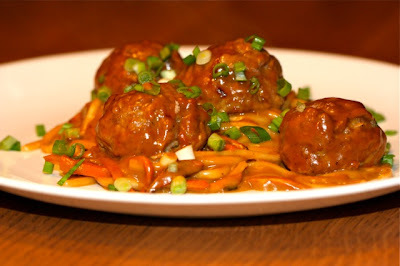 A meatball pasta with a tasty peanut sauce sounds like a great idea!